East London Dance, in partnership with Big Dance commissioned Natasha Gilmore to choreograph Dancing StAGES, the pan-London older people’s project. It was co-commissioned by Capital Age Festival and presented on the Clore Ballroom at the Royal Festival Hall. The final event brought together 185 dancer 60+ from 11 different groups from across London in a high quality and incredibly moving performance. 60 of the dancers had not participated in dance activity before other than social dancing. 'It was a great day, the enjoyment & achievement radiating from the performers was palpable. "After the performance, I was speaking to a friend that has been working in older people's arts for years who said this was the first standing ovation she has given in over 10 years! High praise!!" 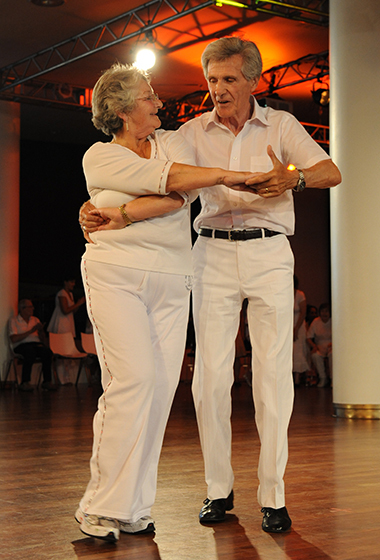 "I think the performance was a total success and triumph for dance with older people. All of the dancers that I saw afterwards were shining a light of energy and achievement." "It was amazing to meet people that have the same love of dance that I do. I wish we could work together all the time." "This is the first time our Day Centre has ever been involved in a project like this. The artists are excellent and so professional and the project has given us such a boost to get involved in more stuff. We are planning to set up regular dance classes for our service users and try and get them out and about more. They loved being looked after at the event and being made to feel like special guests.'"